Live Creating Yourself. : Andrea's Wedding: Not your ordinary bachelorette party. Andrea's Wedding: Not your ordinary bachelorette party. Seeing as I am my sister's only bridesmaid/maid-of-honor/wedding planner, it was my job to organize and host her bachelorette party. Let me preface this by saying I have only ever been to one bachelorette party, it was two years ago, and I had nothing to do with the planning. Needless to say I was a little overwhelmed and didn't really know what I was doing. What I did know was that my sister and I are quite similar in a lot of ways, and fortunately, we both. hate. strippers. Ew. Don't get me started. So this was not going to be your "average" bachelorette party complete with feather boas, beads, and phallic drinking straws. And no stripper. Instead, I invited ten of her friends over for dinner, games, dancing, and a hella lot of wine. 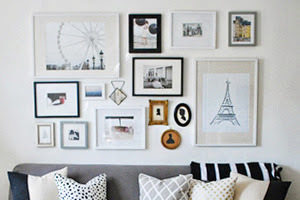 But let's start at the beginning... first stop: decor. 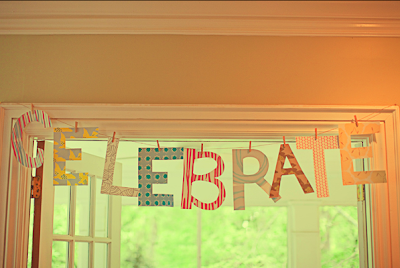 The CELEBRATE banner from one of my favorite weddings (that I posted about here) is something I've been wanting to recreate for a while. This has been in the inspiration folder for my sister's wedding since before they were even engaged. Shh... don't tell her fiance that. Yes. I really did cut out all of the letters by myself. It actually went a lot faster than I suspected, even if the 'B' didn't turn out so well. I thought this image from Lonny was perfect for a summer, gals-only gathering. 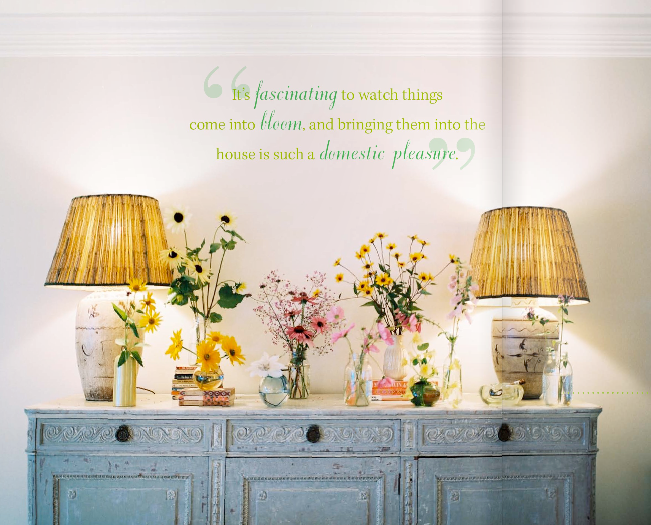 The whimsy and color of the wildflowers add cheer to the space in a casual way, which is exactly what I wanted for this party. To replicate the look, all it took was a trip to Whole Foods where I picked up some summery wildflowers in various shades of pinks and yellows. My mom helped me arrange them, using all of my vintage thrift store vases, mason jars and milk glass goblets. I still have that blank wall above the chest, so I recreated the whimsical CELEBRATE banner with some various pretty patterns I found at Paper Source and stuck it up for extra pizazz. I simply paper-clipped the letters to a strand of pink raffia. I also threw an Ikea tablecloth over an old desk and placed it against the window to corral gifts. Salad, appetizers, and brownie bites were all placed out. Pizzas were still cooking at this point. I set the plates, napkins, and forks in a tray for people to pick up as they made their way around the table. Before all the guests arrived. For favors, I packaged three mini oatmeal chocolate chip cookies in clear plastic bags, tied them with pink raffia, and set them out on a beautiful milk glass platter. I thought this snack would come in handy for the girls later in the night... ya know, when you've been out drinking all night and are in dire need of food circa 12:30am? Just me? This is a scaled down version I took the next day once I realized the photo from the night before was so blurred. My bride-to-be sister and me much later in the evening... this is the best picture I could find of the two of us given how many glasses of wine we'd consumed by that point. Hazy. Out of focus. Sounds about right. And I like to think this picture says, "Job well done, Alaina. Job. Well. Done." Group shot. As you can see, we headed out on the town after my place. Here are a few photos I took the next day once the lighting was better. I just love all these summery colors. Glasses were already cleaned by 9am the next morning. Thank you, Nate, for all your help! Note to self. Need new white candles. One last show of the flowers in the living room. Love the yellow mums juxtaposed to the yellow ikat. So, so PRETTY! I am not a fan of strippers either, and am getting married next spring.. here's my fingers crossed that my friends read your blog and say "geez that's freaking cute!!" SO PRETTY! You did a fabulous job. Your sister must be so thankful! You did an excellent job! Your space is perfect for entertaining. I loved all of the soft colors and combined with the candle lighting off your dolphin gray walls...just lovely! Hopefully you weren't all hungover the next morning! SO pretty!! I love the milk glass and the colours scheme! I love alternative bachelorette parties! They can be whatever the bride wants. Love your decorations, it looks like it was a great party! Awww, I love this!! Everything looks so pretty and it all looks like so much fun!! Everything looks GREAT! How lucky your sister is to have you! You two are so cute in the pics! You did great! Girl fun, I love it!! you can't do wrong honey!! absolutely gorgeous!! I love the job you did. Something I would have done myself - let's see, could you be my daughter? Who needs Las Vegas when Andrea has a sister like you to throw a great party! Wow......you are a great hostess! So impressed! Where did you get the glass serving plates for the party? and by serving plates I mean the glass dishes.....:) Thanks! Best and most inspirational post that I've seen in a long time. I am saving it for my 'inspiration folder.' Even though I have no upcoming weddings, I will find a way to incorporate it somehow! LOVE the banner, flowers, and mason jars! Thank you for sharing your creativity and your sources of inspiration with us. I love seeing how others create and inspire, but just the same- how they themselves are inspired (which A LOT of people/bloggers tend to leave out of the story (not realizing that it doesn't take away from their credibility, only adds). You put together a lovely party! Your apartment is stunning!!! It looks like it came out of a magazine! 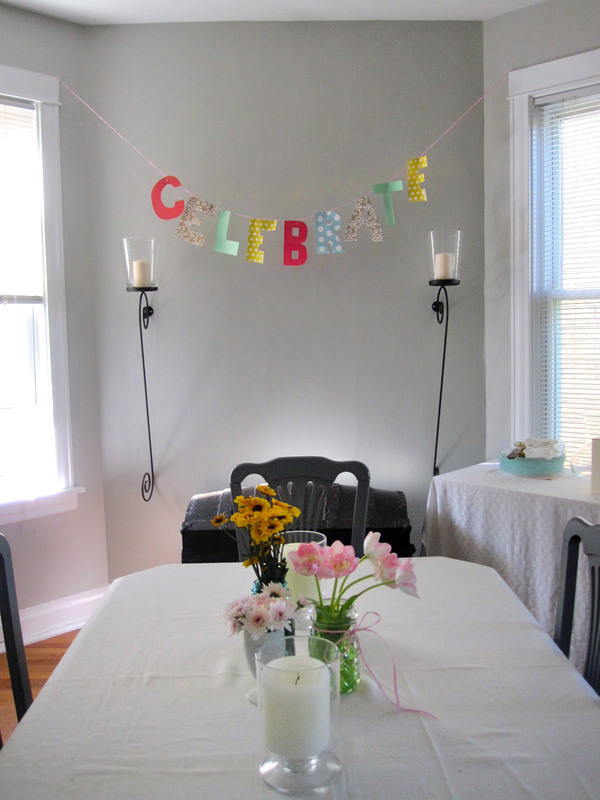 Your home is so lovely as are these sweet party decorations! I adore the "Celebrate" banner! 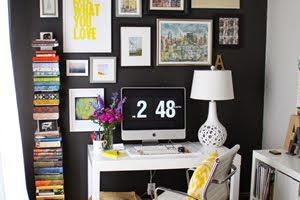 I was wondering what color your walls are! I'm always on the look out for gorgeous, soft gray paint.